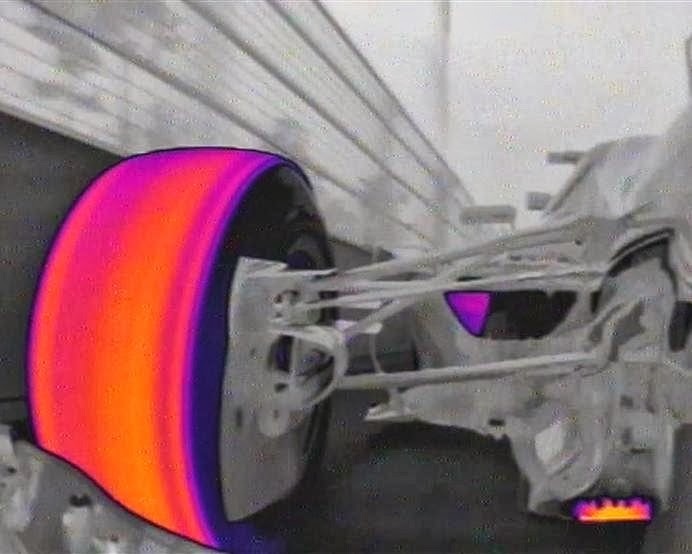 An interesting image cropped up from onboard Mark Webber's car as FOM provided viewers of the Korean GP with the images captured by the thermal imaging camera looking rearward from the cars nose. Many people questioned me on twitter as to why the splitter/plank area seemed to contain so much heat, it is of course plausible that what was being seen wasn't heat. Thermal camera's can be tricked by shiny metallic elements, with Red Bull's leading section of the T-Tray made up of metal it could simply be argued away as a reflection. Furthermore the thermal imaging used here may not be wholly accurate or representative further afield than the tyre it is trying to capture. As we know the plank is actually wood, Jabroc to be precise and is used as a method of discerning if the car is bottoming out. The plank is measured after the race to see if it has excessive wear. This is because the teams will try to run the area as low as possible to generate more rearward downforce. The proximity of the splitter to the tracks surface gives the potential to utilise 'Ground Effect' which is extremely beneficial when considering the airflow then leads into the Diffuser. 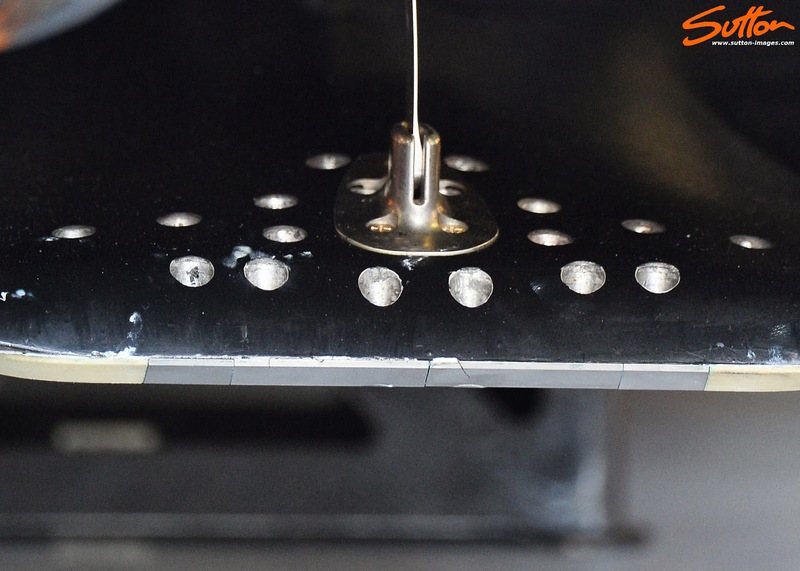 In most instances teams place metal sections into the lower leading edge of the splitter to protect the plank from excessive wear. Some teams also utilise the splitter to house ballast taking advantage of its central location and low centre of gravity. Red Bull have taken their design a step further by encasing the top section of the Splitter in metal too. This may have a thermodynamic/aerodynamic impact as, as the splitter/plank bottoms out heat is generated and passed to the upper surface. Running extreme Rake as Red Bull do can cause compromise over a race distance as, as the fuel burns off an already nose dived car will continue to ratchet upward at the rear. This becomes a problem as the splitter and plank then become embroiled in a game of tag every time the driver enters a braking zone and the car pitches forward. This can have a negative effect aerodynamically as the underfloor becomes starved of airflow, therefore robbing the diffuser and moreover the car of downforce in the critical turning in phase. The FIA have intentionally limited the way in which teams are able to lower the front wing over the last few years to negate this advantage. They've increased the difficulty and loads required to pass the deflection tests. Then when the teams started devising ways of flexing the outer portions of the Front Wing they further increased the deflection tests on this too. So how could the heating of the T-Tray aid in increasing downforce? If we accept that when the front edge of the floor impacts with the ground the heat is transferred to the upper side of the Splitter (like a heat sink). We can also conclude that the air around this becomes less dense and therefore lower pressure encouraging airflow to rush into it. This would encourage both the blocked airflow (caused by the splitter being in contact with the ground) and the aforementioned airflow to migrate into the lower pressure zone above the splitter and be fed rearwards around the cars Sidepods. The additional and accelerated flow of low pressure cools the top face of the splitter and returns the airflow to its natural regime as the car continues on its way. Even without the aerodynamic advantage talked about above that could be gleaned from the heating of the top side of the splitter, we must also consider that using it as a heatsink alone has an advantage. The transfer of the heat via the lower skids to the upper element of course still allows the Skid Block / Splitter to run closer to the ground as heat is transferred away from the plank. Therefore meaning it can contact the ground a little more often without the fear of it failing the test after the race. Lastly we also have to consider the stay (the metal element, in the case of Red Bull's latest iteration of the Splitter) that creates rigidity between the forward top face of the Splitter and the underside of the Chassis. Although we can't see any heat transference in the images to the stay it is plausible that this too is conducting heat from the lower element and buckling in the process (Either via lateral flexion or via negative thermal expansion). This too would allow more deflection from the splitter when it comes into contact with the ground further enabling the car's Front Wing to run in closer proximity to the ground. The effects of such a practice are of course consistent with the teams desire to increase rake enabling a Front Wing that runs closer to the ground, whilst also increasing the potential for expansion of the area available in the Diffuser. Is the splitter being heated up and causing an onward effect? I'm not entirely sure and so the theory should be taken with a pinch of salt, however as always I'd rather talk through the possibilities and encourage a debate with you guys. I'd also say that even IF Red Bull are leveraging an advantage from this method it doesn't mean others aren't too and/or they can't. What's your thoughts? By drilling holes along the top of the splitter, the heat retained within it will obviously be released. This is just my opinion, but if Red Bull wanted to lower the T-Tray by transfer of heat to chassis stay then I think we wouldn't see holes drilled I'm such close proximity to stay attachment to the splitter. Just my thinking though! If they are deliberately using the top of the splitter as a heat sink to encourage airflow around the sidepod then that's classic F1 innovation and great thinking. Love the little details such as this. Thanks for explaining what's potentially happening here. Though I admire the intricacy of this line of thinking, I have to wonder if the real answer is rather simpler. Would it be possible to use differential thermal expansion to bend the splitter upwards? If it were, the top surface would have to be kept as cool as possible to maximise the effect. Obviously, this would be invisible to the stewards because they can't replicate the effect when doing deflection tests. Since this offers a way around the stiffness problem, it should have nearly as much potential as a splitter that flexes under purely mechanical loads. Greater ground clearance = lower ride height = front wing closer to the ground = more downforce. It might be hard to get enough deflection, but it should be possible. On further reflection, this probably isn't what Red Bull are doing - the metal stay would prevent flexing, and I don't think the temperatures involved are high enough to weaken it very much. Still, its another avenue to explore. Geothermal heating and cooling have become a new way of sustainability for many buildings. Geothermal heat uses heat from the earth to generate electricity instead of using fuel. Geothermal heating and cooling technology has actually been around for about 50 years, but more recently has picked up speed for a popular way to heat and cool your home or business. Approximately 1 million homeowners and businesses now use geothermal heating and cooling instead of the traditional fuel burning way. This allows the owners to save an average of 30 to 70 percent from regular fuel costs. The environmental benefits are outstanding. For one home to use geothermal heating and cooling for twenty years would be the equivalent of planting 120,000 acres of trees or converting 58,000 cars to zero emission vehicles. The results would be enormous if more people invested in this option. Geothermal heating and cooling became a brand new manner of home for several buildings. energy heat uses heat from the planet to come up with power pretty than exploitation stimulate. energy heating and cooling equipment has really been around for regarding fifty years, however a lot of recently has picked up rate for a preferred thanks to heat and funky your residence or big business. something like one million owners and businesses currently use energy heating and cooling rather than the standard fuel burning manner. this enables the homeowners to avoid wasting a mean of thirty to seventy p.c from regular stimulate prices. The environmental limits are wonderful. For one home to use energy heating and cooling for 14 years would be the alike of planting a hundred and thirty,000 acres of grass or changing sixty eight,000 cars to zero release vehicles. The results would be monumental if a lot of folks endowed during this possibility. There ar ten main edges for change to energy heating and cooling. the primary is safety, as no remnant fuels are life form burned to make energy, therefore there's no danger of blast or venturesome vapors. The second is lower ready prices, as energy heating and cooling has power ratings of 400-600%.heating and Cooling regional principal.